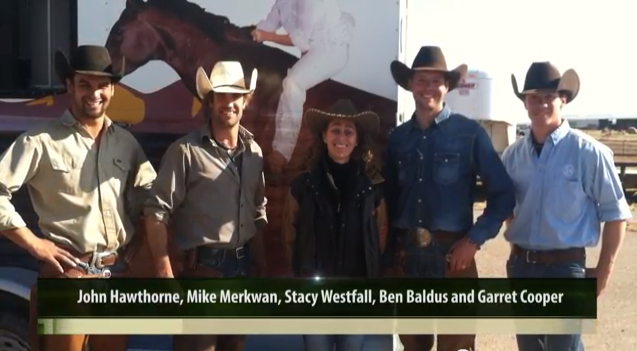 Here it is…the first ‘Stops with Stacy’ featuring our visit to the historic Waggoner Ranch in Vernon, Texas. We actually went to Electra, Texas to the horse headquarters…you know you are on a BIG ranch when it overlaps different towns! The ranch was established in 1849 and is approximately 535,000 acres which makes it the largest ranch in Texas under one fence. We went over for the day to ride and spend time with the head trainer, Ben Baldus and his crew. We knew Ben years ago but this is the first time we visited him at the Waggoner. Touring the ranch is like walking straight into a history lesson. Back in 1945 E. Paul Waggoner bought Poco Bueno for the outrageous price of $5,700 for a yearling. People thought he was crazy to pay that much but Poco Bueno is now an American Quarter Horse Hall of Fame Inductee, Champion and Sire of Champions. Looks like Waggoner had a good eye. Poco Bueno is buried on another section of the ranch and many of the horses carry on his bloodline. The guys offered to take us on a tour, take us to lunch or start some colts…I hesitated for about 10 seconds because I want to see the rest of the ranch but watching them START COLTS jumped out of my mouth even faster. Thankfully they invited us back so maybe I can still get that tour. Did you know? When Poco Bueno died he was buried in an upright position. There has to be a story there. I will have to go find out more details on that. For those who are wondering those shots in the beginning are of the ranch, Major Cattle Company, where we are currently living. Maybe one of the ‘Stops with Stacy’ should be a tour of the Majors ranch. I’m open to suggestions, if you have an idea for a ‘Stops with Stacy’ feel free to post it in the comments. Thanks again to my sponsor Tekonsha, the leader in electronic trailer brake controllers, for coming up with the concept and the name ‘Stops with Stacy’, I think this is going to be fun! ← How do you handle traveling with stallions? Do you haul mares with them? So Stacy are you traveling north? Do you have a list of stops your going to do posted anywhere? We are in the process of building our round pen. We want it to be safe for kids to stand on as we use our horses to help kids at risk. any suggestions? that place looks so educational…and fun…. is there a 2nd “Stops with Stacy” soon???? This new posting you’re starting is going to be interesting to follow. How about a visit at Ransomed Wind Ranch with Dr. Lew Sterrett (Sermon on The Mount) ? Thx for posting. All 4 of my quarter horses go back to Poco Bueno via Poco Lena! Looking forward to your next stop. Give Jac a rub for me, he’s such a handsome bit! thank you Stacy…Ridding along with you is so much fun !!! !